Do you really need the tablet? Update: We're expecting a new Surface Book 2 or Surface Pro 5at Microsoft's forthcoming hardware event. With the Surface Pro 3, Microsoft nearly perfected the formula and showed other computer manufacturers how hybrids should be made. Last year, Microsoft introduced the Surface Book as the 'ultimate laptop'. It finally reached the UK earlier this year an age after its debut in the US. Like the Surface tablets before it, this laptop takes a unique spin on the notebook format that's been around for more than 40 years. Between the 3:2 aspect ratio, 13.5-inch screen and its practically trademarked 'dynamic fulcrum' hinge, there isn't any machine on the planet like the Surface Book – and then, with the touch of a button and a gentle tug, it becomes a tablet. It all sounds like an amazing idea on paper. Milled from two solid blocks of magnesium, the Surface Book feels sturdy and has a minimalistic style unto its own. As well as using the Surface Book in laptop and tablet (clipboard), you can work with the Surface Pen for sketching, artwork or meeting notes. And attaching the laptop's screen the other way around means you can use the device for presentations, watching streaming movies and more. Microsoft is particularly aiming Surface Book at creatives (the traditional MacBook Pro heartland). It has worked with Adobe on Surface Pen support. Using the Surface Pen with the Surface Book is a joy. Touching the screen with your finger is still a bit odd, even in Windows 10's Tablet Mode, but it is useful for flicking through things like pictures. Better still, it's a total portable powerhouse with design studio-level performance and dedicated graphics, making it one of the best Windows-based tablets around. From keyboard deck to the palm rests, the interior of this laptop is one flat surface of metal, save for the large space reserved for the glass touchpad. Similarly, the screen lid comprises one slate of magnesium, with its only extra flourishes being a mirror-finished Windows logo in the centre and a rear-facing camera. Along the chiselled sides, you'll find two flat edges that start from the top of the display and terminate at the tip of the palm rest. That's not the only seamless transition. Unlike most other convertible devices, the screen and base sections share nearly the same thickness and weight. Without knowing the display can detach, the Surface Book looks like one device, thanks to the hinge. Even though the Surface Book is quite a chunky device, the overall aesthetic is good even if the grey colouring feels a little eastern bloc apartment block. It's very hard to look past the clever hinge. It sits at the midpoint of the device, there's the 'dynamic fulcrum' hinge. And it's this key piece that makes the whole device work. When the Surface Book was announced last October the hinge quickly became a discussion point. Laptops with detachable screens have an inherent problem; the screen is often heavier than the base. Surface Book's tablet part is understandably heavy at around 700g. Rather than folding flat, the hinge coils into itself, leaving a gap between the screen and keyboard when the unit is closed. When opened, this same part rolls out and extends the base of the laptop, which in turn helps extend the support base for the tablet portion of the Surface Book (called the Clipboard). 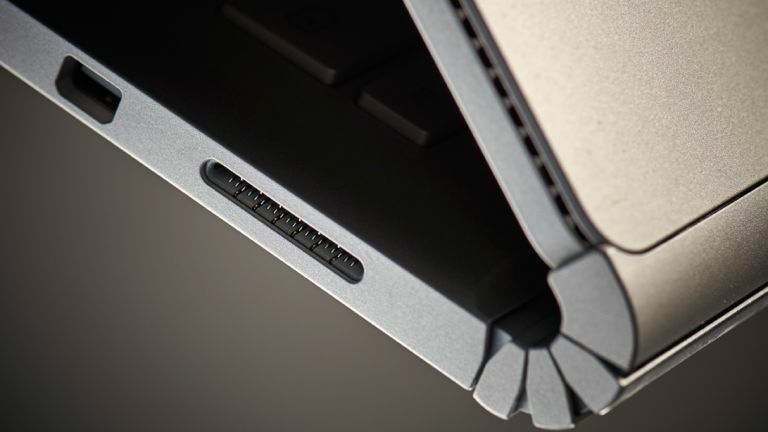 The Dynamic Fulcrum Hinge is designed to maintain the balance between the two parts of the device by enlarging the footprint of the laptop when it's opened. Another clever aspect of the hinge is that it uses 'muscle wire' to lock the tablet into the keyboard (you detach it using a key on the keyboard). When it's a laptop, it stays as a laptop. Dust and other bits will not slip into the interior any more than with a standard laptop, unless you're a particularly messy person. After a week of using the Surface Book constantly, we could run our finger against the inside edge of the hinge and not find a single speck of dust. Another plus side of having a laptop that doesn't close completely flush is you'll never find any oily outlines of the keyboard imprinted on the screen. It's a design element that also eliminates the need to seat the keyboard into a recessed area. Instead, the keys on this laptop sit flush with the keyboard deck. While a traditional notebook display might weigh half a pound at most, the top section of the Surface Book weighs over 700g, because it contains all the necessary parts to act as a standalone tablet. As such, the hinge has been reinforced and contains extra mechanisms to keep it in place. Surface Book is solid, and you can even pick up it by the display and shake it about without worrying it will fall apart. On a flat surface, the screen is held in place and even stays put when you have it in your lap. The screen seamlessly pops off the base with the tap of a button. Undocking and attaching the Clipboard is smooth. After pressing the eject button on the keyboard or the virtual button in the taskbar, the screen will blink off for a second and then notify you it's safe to detach the screen with a quick tug. It's fast and simple, however, the timing takes a little getting used to. After you get the prompt to detach the screen, you have to wait for about half a second before you can actually lift the display off its base. With a starting weight of 1.51kg, the Surface Book is one of the heaviest 13-inch laptops. And that's without the optional, discrete GPU, which ends up adding a few extra ounces and bumps up this laptop's total weight to 1.58kg. While this might look like a lot on paper for an Ultrabook-class device, consider the 13-inch MacBook Pro weighs just as much despite it packing a smaller screen, no dedicated GPU and fewer batteries. Thanks to its 3:2 aspect ratio and 13.5-inch screen, the device is quite a bit taller than your average 13-inch laptop, but you'll have no problem slipping this laptop into bags designed to hold a standard 13.3-inch laptop. The other thing that's on the heavy side is the price tag, the Surface Book asks for a pretty penny that's typically reserved for high-end gaming notebooks. And that's even applicable to price associated with its most basic configuration, which is essentially a more expensive Surface Pro 4. We've got the maxxed out version on test here, but there is one other model featuring Core i7 with less storage and memory (8GB and 256GB). Then there's a Core i5 equivalent of that and finally at the lower end (£1,299) there's a model without the dedicated Nvidia graphics. Both the rival MacBook and HP Spectre go all out with their support for the latest super-fast USB-C connectivity standard. But despite Surface Book's self-confessed claim to be the 'ultimate laptop', it eschews USB-C in favour of a couple of USB 3.0 ports. Naturally this is good for legacy support, but it doesn't really help Surface Book's claim to be the best around (the Spectre, by contrast, just puts a USB-C to USB 3.0 adapter in the box). The Surface Book's display is pin-sharp with fabulous colour. It's difficult to fault, although we're not massively keen on the aspect ratio. If your idea of a super display is pixels and nothing else, the Surface Book is a winner. Its 13.5-inch display is very pixel-dense at 267ppi compared to the latest MacBook's 226ppi. The so-called 'PixelSense' 3,000 x 2,000 display has also got 10 point multi-touch let's not forget and can be driven just by the integrated graphics in the tablet part of the device. When a new standard needs to be adopted, we look to new tentpole devices to lead the way. USB-C is supported on a handful of smartphones, such as the Google Pixel and more and more laptops are also supporting it. The Surface Book plumps for mini DisplayPort as its key display connectivity option – unlike the others it doesn't have a standard charging port, either, instead replying on a proprietary charger. We love the flexibility of this do-anything machine – it's so powerful. But you do need to be able to justify why you need the detachable Windows tablet part, we believe. Mind you, if you stripped away the Clipboard's ability to detach, the Surface Pen, the neatness factor of the hinge and just about everything makes this machine unique, you would still be left with terrific laptop. Underneath all the extras, this is a solid laptop in terms of ergonomics and performance. Incorporating the extras – from the ability to run off with the clipboard, the accuracy of the Surface Pen and the engineering feats of the hinge – they serve to enhance the experience, rather than distract. And, in time, Microsoft will smooth out the rough edges. If you want an excellent laptop that does just a bit more, then this is the one. All-round, it's an awesome laptop.